Before the finish can be applied, its important that the bow be thoroughly sanded to remove any unsightly blemishes or scratches. I like to start out sanding the riser with 80 grit paper. This coarse paper helps round off any unwanted ridges that have been left from the shaping process. I then progress through 100 grit, 150 grit, 220 grit and finally 320 grit. Its time to sand the fiberglass when you have loaded your sander with 220. Sanding the glass is necessary to guarantee adhesion of the final finish. Once you have the bow sanded and are ready to apply the finish, wipe it down with a tack cloth. This sticky material will remove any dust or sanding particles. Don't rub hard with the tack cloth however since that can leave a waxy residue. 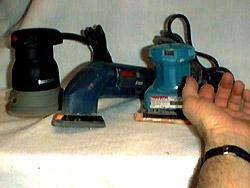 Below are some of the tools commonly used during the sanding process. Pictured above are several types of sanders. Left to right are: random orbit, detail, finish and the ever popular palm sander. Its important to put a high quality finish on your bow since it protects your investment in both time and money. There are numerous finishes that will provide this protection. Some of the most commonly used are Fulle Plast, Thunderbird and numerous brands of polyurethane. Fuller Plast, made by Fuller O'Brien, is probably used by more bowyers than any other finish. It is a two part catalyzed varnish which builds quickly to a very deep looking, durable finish. FP is thinned using lacquer thinner or Synol thinner, and when thinned can be used as its own filler by sanding after each coat until the pores are filled. According to the manufacturer, there are no compatible commercial fillers available. It does have to be applied using a spray gun or air brush and once dry it is difficult to clean off your tools. It dries to the touch in approx. 20 minutes and should, according to the manufacturer, be recoated within 2 hrs. Thunderbird when applied is a lacquer but converts to a polyurethane in approx. 6 hrs. This characteristic gives you a 6 hour window to complete your finish work. If you try to apply coats after the conversion has taken place, the lacquer being applied can soften the polyurethane. Thunderbird can be brushed on, however I've never tried it so I can't speak from experience regarding this application technique. There is a compatible Thunderbird filler also available which works very well. Any unused amount of Thunderbird, since it is not catalyzed, can be returned to its storage can without contaminating its contents. Clean-up can be easily accomplished with lacquer thinner. Polyurethanes have been around for a long time and have been used to coat many bows. They can be brushed or sprayed with excellent results. The drying time is quite long and on some oily exotic woods such as Cocobolo, it never seems to completely dry. Paint thinner works for clean up on oil based poly and water for the newer water based urethanes. In the past, water based urethanes had a tendency to yellow, but newer outdoor formulas have alleviated that problem. Left to right: Fulle Plast with catalyst and synol thinner. Thunderbird finish, thinner and sealer. Outdoor water based polyurethane. All of these finishes should be considered harmful to your health when their vapors are inhaled. Respirators should always be worn when these or any other finishes are being applied.